Psychological reasons and social stressors are contributing to the low back pain epidemic, say Australian experts. Work dissatisfaction, family stress and depression can enhance low back pain which is on the rise in developed countries, say medical experts. The "epidemic" is also compounded by Australia's ageing population and our increasingly sedentary lives. But while patients often have high expectations of modern medical solutions, spinal surgery is controversial and the benefits can be marginal, say Associate Professors Leigh Atkinson, from Wesley Pain and Spine Centre in Brisbane, and Andrew Zacest from Royal Adelaide Hospital. In Australia, spinal fusions have increased by 175 per cent over 10 years, with a disproportionate increase in the procedure in private hospitals compared with public hospitals. 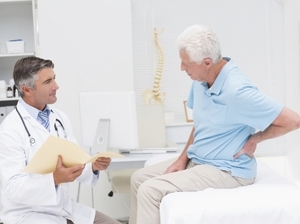 "The current high incidence of chronic low back pain in developed countries has little to do with biomedical explanations and is best understood in terms of a biopsychosocial framework," they wrote in the Australian Medical Journal. This includes work dissatisfaction, family stress, depression and a cultural bias toward symptom relief. "In Western medicine, current approaches to this problem, including the overuse of expensive diagnostic imaging, have failed and have in fact exacerbated the problem, because of the misunderstanding of the aetiology of the condition." They called for a national audit of patient-centred outcomes for spinal fusions.